Android users keep asking these questions to Google; How do you restart your camera on Android? Solving android camera error? How do I fix camera warning failed? Why did my camera stop working? How do I reset my camera? How to fix camera busy error? And so on. There are a lot of issues that you face on your Android smartphone. If you start listing them and if you see a count of these issues, you will be surprised. But "Camera busy, Camera unable to start. If this repeats please power off your phone and restart." issue is one of those typical Android errors. This issue is usually seen on screen when you try to launch camera application. I've seen even "Still can't connect to camera" on other Android OS based smartphone like Xiaomi etc. And it’s annoying when you are using the camera or trying to launch the camera etc. Sometimes, this error also triggers when the OS itself crashes. This camera error makes it almost impossible for the user to use their smartphone cameras smoothly. 3 Reasons why camera unable to start? Before solving this issue, you should get down to the bottom of it. There are couple of reasons behind why this 'Camera Busy' error on Android smartphones is showing on your display. Force close - It could be a possibility that, last time the way you have closed the camera is not an appropriate way. Multitasking - You might be using the camera features on different apps at the same time. Image processor - This could be an internal error where image processing is not smoothly done by the OS itself. Anyways, in this article, I'm going to explain the quick solutions for the most possible reasons that cause this error. I've listed a couple of steps below which will help you fix this Camera Busy‌, Camera unable to start Error on Android quickly. 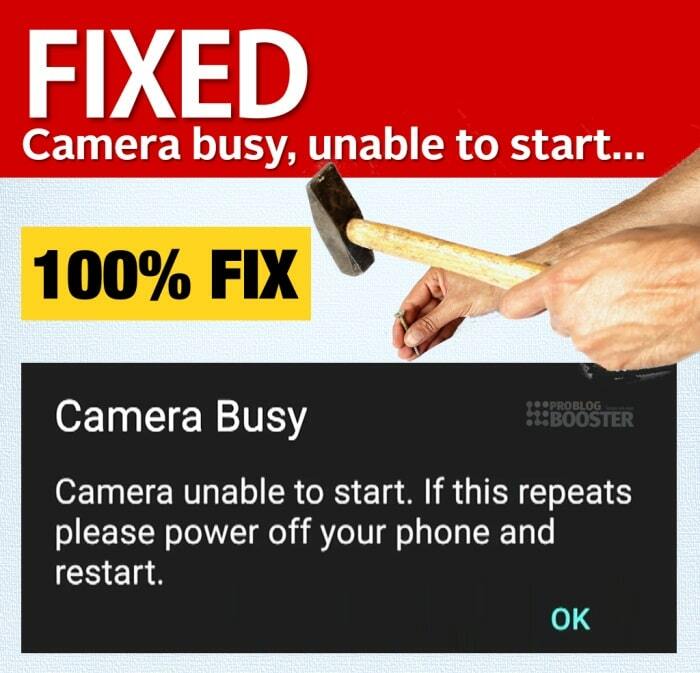 Fix "Camera Busy​‌, Camera unable to start" Android camera error. Tap on Cached Data and clear it. Try to Clear Cache as well. Also try to Force stop the app. Use Volume up and Volume down arrows to navigate across the screen. Navigate to wipe cache partition option and use Power button to confirm. That’s all, just restart your smartphone. Sometimes, you will just have to check whether your camera application is up-to-date. Just connect to Mobile network or WiFi network and tap Check for updates in Playstore. Allow your OS to complete the updates. You might not face this issue anymore. Please note: Before implementing this method, please take a backup of your data like contacts, images, any other personal data etc. Navigate to Backup and Reset option. A prompt will be displayed with a message saying all the data will be erased from your device memory including your accounts, data, settings, apps, music etc. Tap on Reset phone button. On the restart, you will find your phone get reset and no data will be present on your phone. This is one of the last tries to resolve this error. If you are facing this error or something you want to suggest apart from the above points, feel free to use below comment section to get in touch with me anytime. Happy to hear from you and to implement the suggestions for helping others.